Hello! Long time no post. It has been busy the last two weeks over here at Avery Elle. Thank you so much for all of your orders! 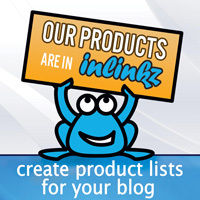 We cannot wait to see what you create with our products. I personally love seeing each and every project you make. Take a look at what Piali made with our new Ikat stamp set. I love the colors she chose. So pretty! To get more details, you can check out her blog here. I will be back to post some fun projects using more of our stamp sets next week. Who knows, maybe we will even post a free cut file! Have a great weekend!! Have you seen this amazing watercolor card by Lalo? 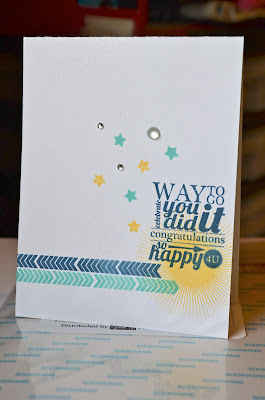 We are amazed at what she did with our Bright Days stamp set! So cool! Be sure to check out her blog here for more details. If you create a project with one of our stamp sets, we would love to see it. You can send them into us at customerservice@averyelle.com, post them to our flickr account or on our Facebook page. We just might feature you here on the blog! Hello! We hope that you have enjoyed our August Release Week. Here are some final projects that the Design Team has created with our newest clear photopolymer stamp sets. I love what Chunyuan did with our Blooming Banner set. The simplicity and graphic nature of these card are so inspiring to me. 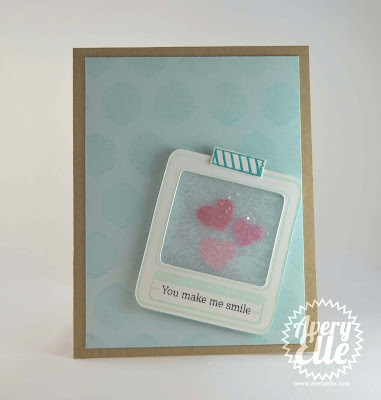 JJ created this adorable card with our Picture It and Hello stamp sets. How can it not brighten the recipient's day?? 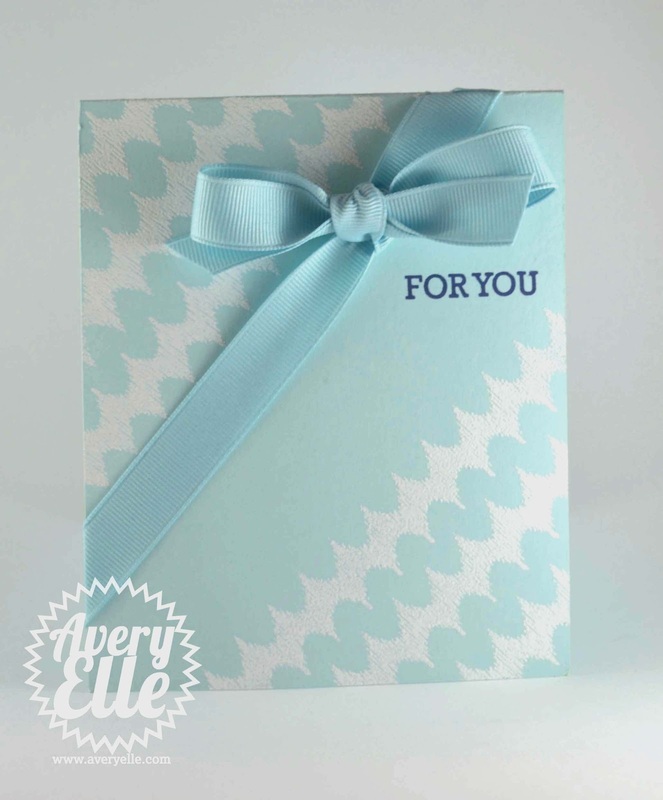 JJ also created this amazing card using our Ikat set. I love how she turned the background strip vertically to create this look. Be sure to check out her blog for more details. Heather created these beautiful cards using stamps from Sentimental Swirls, Blossoms & Blooms, and Ikat. So pretty!! Be sure to check out her blog for more details and another cute project. Kasia created this bright and sunny card using our Ikat and Framed Fonts stamp sets. I love her bold color combination. Thanks for stopping by to take a peek today. We have had so much fun during this week's festivities. Have a great week! 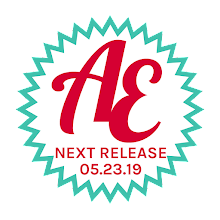 Welcome to Release Day at Avery Elle! We hope that you have enjoyed all of the projects this week. Here is a quick summary of all of the new products that are now live in the store. Our 8 1/2" x 11" premium heavy card stock comes from a mill in the United States that is known to be the best in the letterpress and graphic design industry and is chlorine / acid free. All of our colors are sold in the following packs - 12 sheets for $3.50 and 25 sheets for $6.50. Our Ultra Smooth Pure White, Speckled & Kraft card stock is also sold in a 50 sheet pack for $11.50. In case you don't already know, we also sell a card stock assortment pack that allows you to purchase any color you wish in any quantity you wish - 25 sheets for $7.50. Thank you for all of your kind and encouraging comments! You have really brightened my week! Don't forget to check back with us tomorrow morning for some final projects from our great Design Team. The winner of our August Release Week Contest is Vera!! And, I like Avery Elle on FB! Please email us at customerservice@averyelle.com so that we can get you your $25 credit. Welcome back to Day 4 of Avery Elle's August Release Week. If you have just stumbled upon this blog, you may want to go to this post here to start at the beginning of the festivities. We are introducing the final stamp set in the release today and we will be featuring projects made by our AMAZING design team. 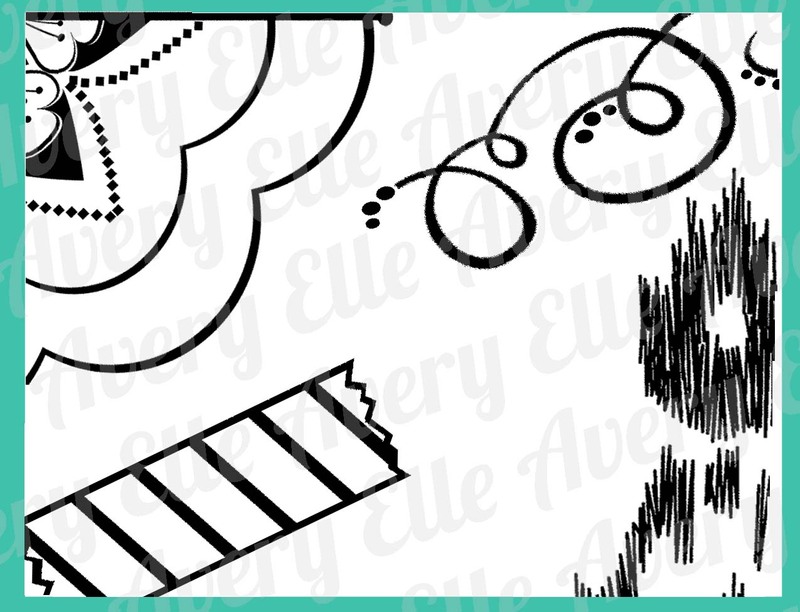 We have 4 new stamp sets and 4 new colors of heavy card stock and grosgrain ribbon that will be available for purchase in our store, www.averyelle.com, August 14th (tonight) at 12:00am EST. Today is also the last day that you can enter our $25 store credit giveaway. Scroll to the bottom of this post for all of the details. **Store Stock Update: We have had some customers ask if our Framed Fonts stamp set will be back in stock for this release. Yes, it will be available for purchase when the rest of the release goes live later this evening. 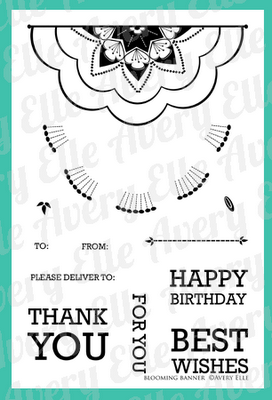 Today we are featuring a new 4" x 6" clear photopolymer stamp set called Blooming Banner that will retail for $15. The Banner measures: 3 1/2" x 1 5/8"; Happy Birthday Measures: 1 1/4"x 1/2"; For You Measures: 1 1/4" x 1/4"; Thank You Measures: 1 1/4" x 7/8"; Best Wishes Measures: 1 1/4" x 3/4"
Be sure to check out what the following members of our design team have done with this fabulous set on their blogs below. 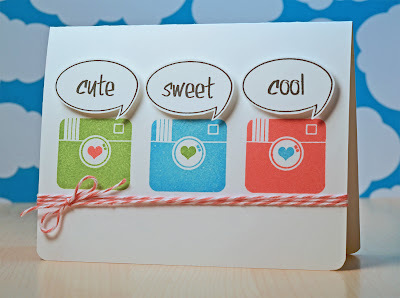 I love the ability to use multiple ink colors in my stamped images. It creates an added depth that is so pretty to me. That was my inspiration for our Blooming Banner stamp set. I wanted to create a modern / graphic "flower" image that could be stamped quickly and easily yet look beautiful alone or with embellishments. In this first card I stamped the main image twice in soft grey ink and stamped the details in aqua onto our Ultra Smooth Pure White Card Stock. I left enough room in between the two images so that I could add a Fizz bow. I used our Sea Glass Heavy Card Stock and new Fizz Heavy Card Stock for the color palette. I stamped the same banner image in yellow ink to match our new Mimosa Heavy Card Stock. I added the details in soft grey this time. I love the shape that the negative space creates when stamping this image onto the corners of this smaller note card. I can picture cards using all of the included sentiments in different colors. Perfect for teacher card gift sets, etc. This last card shows how the image can also stand on its' own. 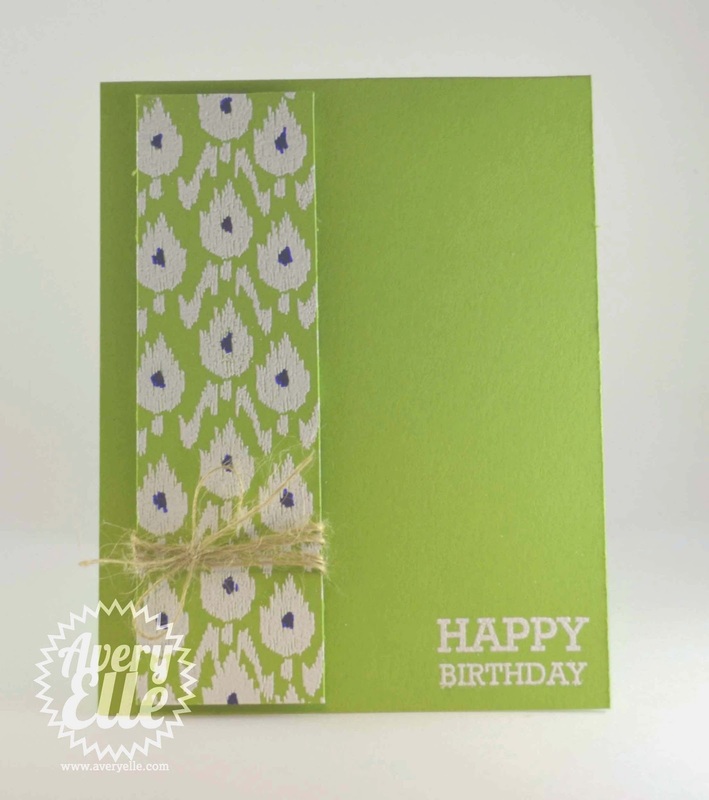 I used our Sea Glass and Celery Heavy Card Stock for my color palette. I do believe the looks that you can create with the set are endless. 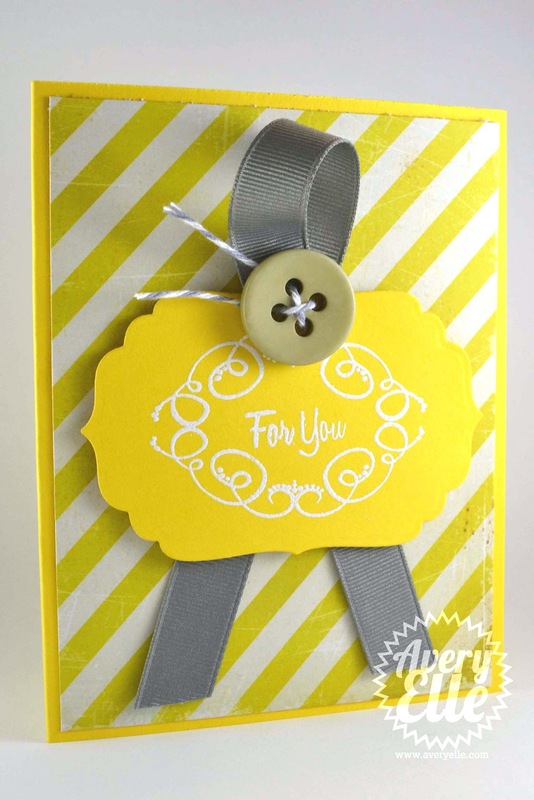 We are also introducing a new card stock and grosgrain ribbon color called Daisy this month. 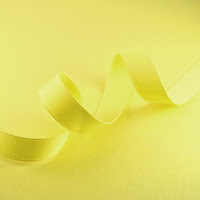 Daisy is a very pretty soft yellow and fits in perfectly with our existing color line. Another new product this month is A2 envelopes that match perfectly with our Ultra Smooth Pure White Card Stock. Our Pure White envelopes come in sets of 25 for $5.25 and will be available for purchase in our store on August 14th at 12am. Today is your last chance to enter to win a $25 gift certificate to our store. Please comment to let us know about each entry. We will be running this contest through this evening at 10pm EST. 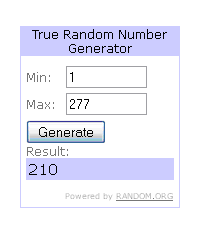 The winner will be announced tonight by 11pm EST. All products will be available for purchase this evening at 12am EST on Tuesday, August 14th. The store will be down this evening for maintenance from 11PM EST until the release goes live to ensure that the website is functioning properly after the new products are loaded. Thanks for stopping by to take a peek! Be sure to stop by the blog tomorrow when we will be showcasing some final projects created by the design team here on the blog! Welcome back to Day 3 of Avery Elle's August Release Week. 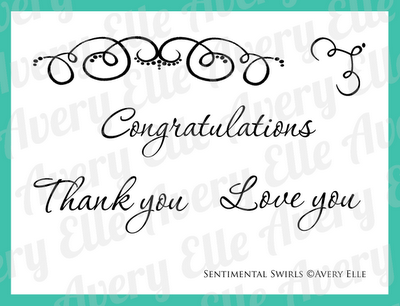 Today we are featuring a new 4" x 3" clear photopolymer stamp set called Sentimental Swirls that will retail for $8. The Scroll image measures: 2 3/4" x 1/2"; Love You sentiment measures: 1 1/2" x 3/8"; Congratulations sentiment measures: 2 3/8" x 3/8"; Thank You sentiment measures: 1 3/4" x 3/8". A really great font can make a sentiment and this one has always been a favorite of mine. I wanted to create a more formal set in this release but also one that was at a lower price point. By creating the two swirled images separately, a stamper can make different framed images, underscore a great sentiment, or create a stunning background. This first card is pretty bold and I love that. The yellow base and mat are cut from our new card stock color Mimosa. 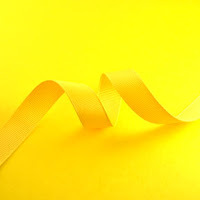 It is a beautiful bright and sunny yellow. 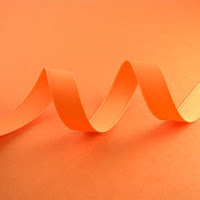 It seemed to pair perfectly with the grey grosgrain ribbon. (Maybe something new that you will see in our October release??? - you have to love a sneak peak within a sneak peak!!) I curved the larger image slightly on my acrylic block and stamped it twice to form the frame. I heat embossed it with white embossing powder along with the For You sentiment from our Blossoms & Blooms stamp set to complete the look. 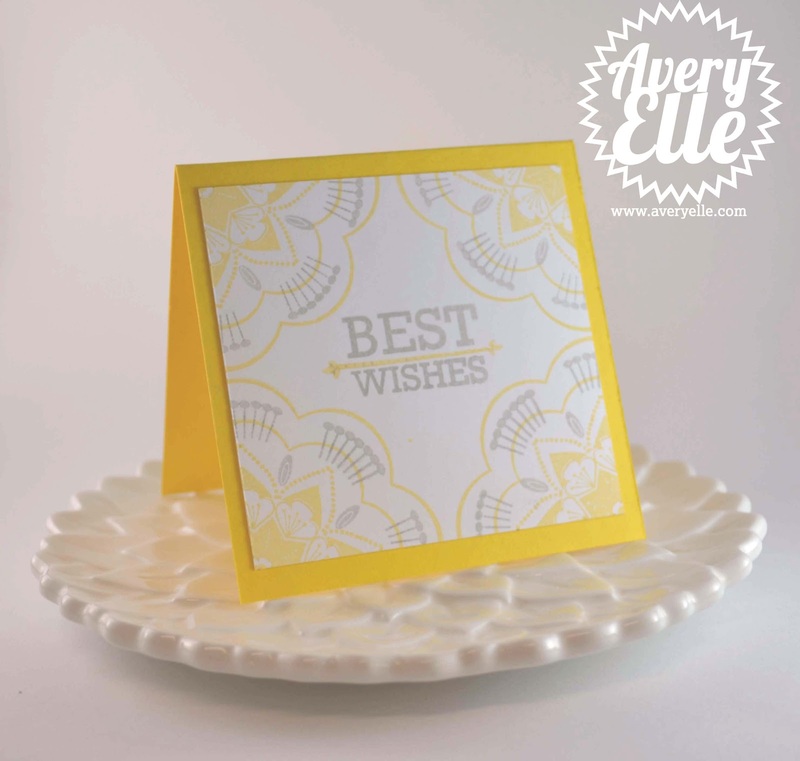 This card shows how you can use both images included in this stamp set to create a larger frame that will fit all of the sentiments included in this set. I stamped the images and sentiment in Versamark and then used white embossing powder so that they would stand out against our Kraft Heavy Card Stock. I wanted to keep the look soft and simple. This card could definitely be used for a baby shower, a wedding or an anniversary. Sweet! The last card from today uses the same images as the card above. The difference here is that I angled the stamp slightly on my acrylic block so that it was in a straight line. I used that image to stamp the background of the card below. I think that it creates a fun, yet elegant damask-like pattern. I stamped the smaller image included to create a tag to hold the Love You sentiment. Well that is all for today. What do you think of what you have seen so far? Any favorites? In honor of our Release Week, we are giving away a $25 gift certificate to our store. Please comment to let us know about each entry. We will be running this contest through Monday, August 13th at 10pm EST for all of our Release Week posts. The winner will be announced on Monday, August 13th by 11pm EST. All products will be available for purchase at 12am EST on Tuesday, August 14th. Thanks for stopping by to take a peek! See you tomorrow! 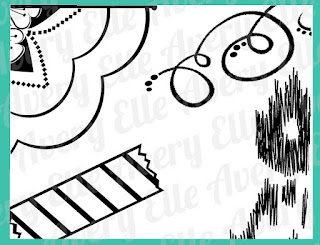 Welcome back to Day 2 of Avery Elle's August Release Week. If you have just stumbled upon this blog, you may want to go to this post here to start at the beginning of the festivities. Over the next 4 days we will be featuring projects made by our AMAZING design team and showcasing our latest release. 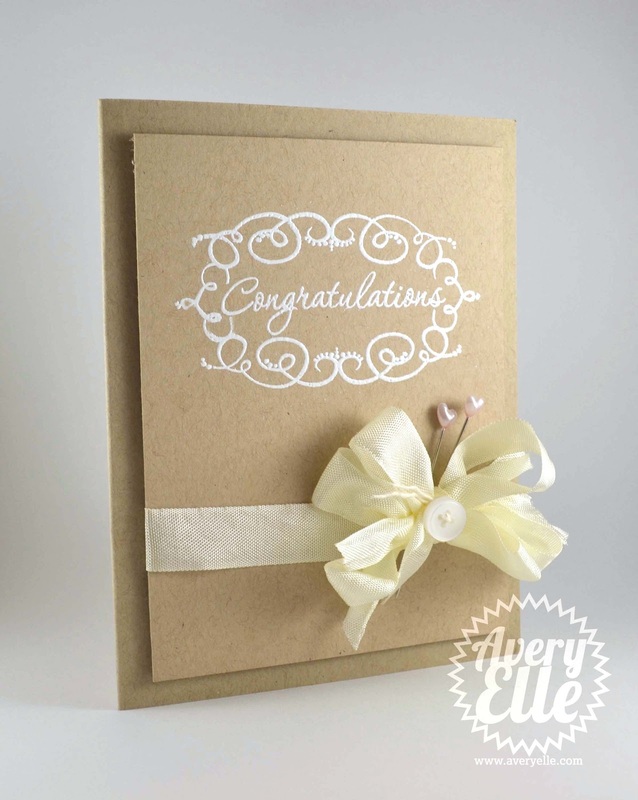 We have 4 new stamp sets and 4 new colors of heavy card stock and grosgrain ribbon that will be available for purchase in our store, www.averyelle.com, on August 14th. Don't forget to check the bottom of this post for our latest giveaway to celebrate the festivities. Let's get started. 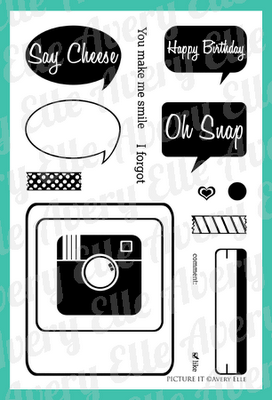 Today we are featuring a new 4" x 6" clear photopolymer stamp set called Picture It that will retail for $15. The Frame image measures: 2 3/8" x 2 3/4"; The camera measures: 1 3/8" x 1 1/4"; The Label image measures: 1/2" x 2"; Say Cheese Speech Bubble measures: 1 1/2" x 1"; The Washi Tape images measure: 7/8" x 3/8"
Kasia Curry - Kasia's posts for this release will be slightly delayed due to factors out of her control, but you will definitely want to check out her blog to see her amazing projects using stamps from our June release. I love the versatility of Picture It and think that it would be great not only for cards, but for Project Life albums (the frame will fit perfectly in those smaller 3 x 4 pockets) and scrapbook pages as well. I have wanted a speech bubble set for a while so this was the prefect opportunity to create one along with my current love of the polaroid trend. I think that the addition of the washi tapes, label, and Comment / Like sentiment makes this a fun set! Have I mentioned that we will be offering free .svg and .pdf cut files for our entire collection of image stamp sets here at Avery Elle? Yes, I did say free. If you have an electronic cutting machine, you will now have the ability to cut shapes for our stamp sets. How awesome is that? In this card below I used the Picture It cut file to cut the frame and washi tape images out of our Ultra Smooth Pure White card stock. I simply stamped the frame, label and You make me smile sentiment onto it. Easy! Inside the frame I created a small shaker using glitter and some small foam hearts. To give the background a subtle detail, I stamped one of our Ikat background strips onto Sea Glass card stock using Versamark ink. In the card below you can see how I created a totally different look with the same set. I flipped the Say Cheese and Oh Snap speech bubbles over and used their back smooth side to stamp the blue and yellow bubble onto Ultra Smooth Pure White card stock. I love bonus stamps like this! 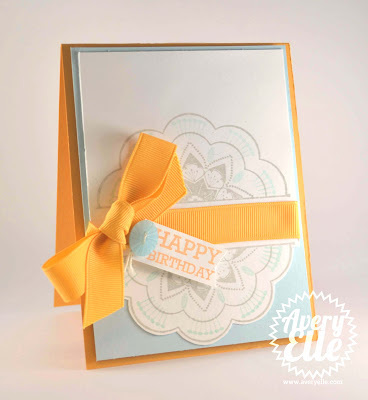 I then stamped the Happy Birthday bubble onto the corresponding die cut. This last card features the small camera image that comes with the set. I used the coordinating cut files along with the stamps to create this fun card. 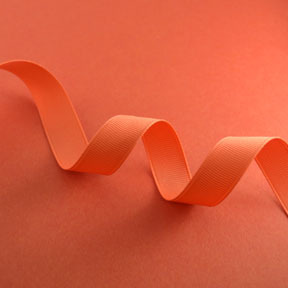 The card base and ribbon are a new color, Papaya, being release this month. I love that we will have both a deeper and lighter orange in the store next week. Don't forget that in honor of our Release Week, we are giving away a $25 gift certificate to our store. Hello! 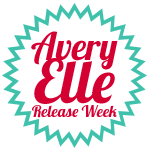 Welcome to Avery Elle's August Release Week. Over the next 5 days we will be featuring projects made by our AMAZING design team and showcasing our latest release. 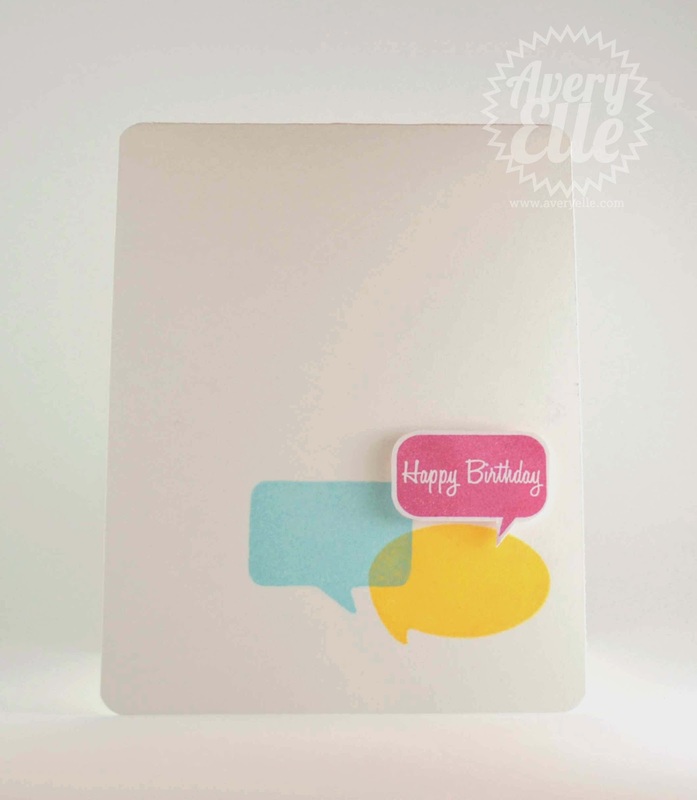 We have 4 new stamp sets and 4 new colors of heavy card stock and grosgrain ribbon that will be available for purchase in our store, www.averyelle.com, on August 14th. Don't forget to check the bottom of this post for our latest giveaway to celebrate the festivities. Let's get started. Today we are featuring a new 4" x 6" clear photopolymer stamp set called Ikat that will retail for $15. The Missoni styled strip measures: 1" from tip to tip x 5.5"; The center strip measures: 7/8" x 5.5"; The Ikat strip on the right measures: 1 1/8" x 5.5"
I have had this set in my head for months after seeing all of the beautiful Ikat motifs popping up in home decor and am so excited that the time is finally here to introduce it! My inspiration for this first card is a button that I found in my stash. 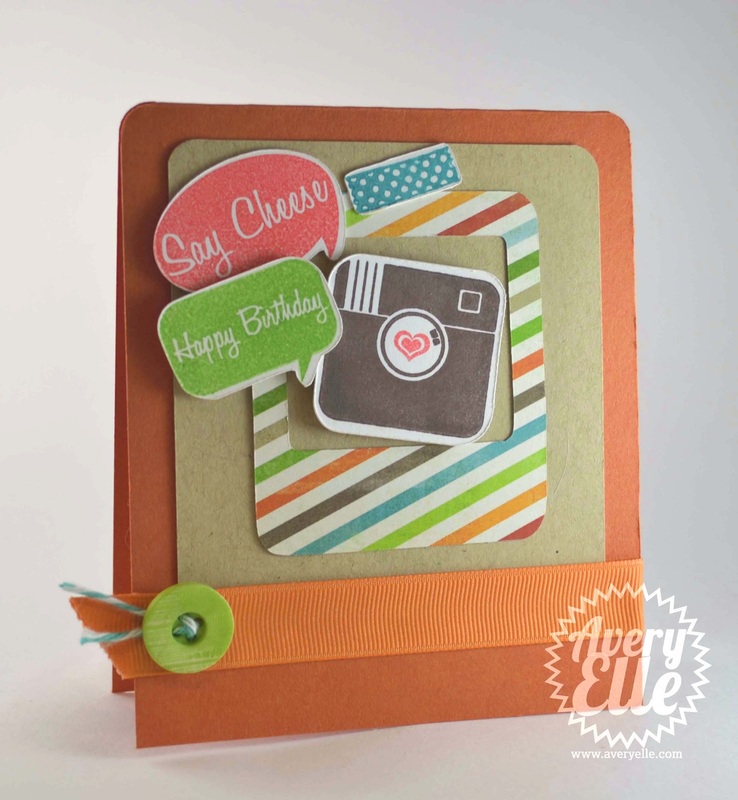 I pulled the dark brown, orange and taupe colors from the button and set off to create the card. I stamped the Thank You sentiment (from another set that will be released later this week) onto vellum and heat embossed it. After adding my new favorite button threaded with twine, I was really happy with the result. I have trouble making masculine cards at times, but this set made it so easy for me. Love that! The card base is one of our new card stock colors called Fizz....isn't it so perfect for fall?? I wanted to show you how you can create different looks with the same Ikat pattern that I used in the previous card. In this card I stamped it onto Lemon Grass Card Stock and heat embossed it with white embossing powder. I took out one of my trusty Sharpies (Don't tell anyone, but I don't own any Copics....I know I know!!!) and colored in the center of the image in a navy blue. I think that there are SO many different color combinations that will be able to be made this way and I am eager to try them out. I stamped the Happy Birthday sentiment (from another set we will be featuring later this week), embossed it, and wrapped the Ikat panel with some jute twine to complete the look. This Ikat background stamp has a long rectangle as it's base. It really does make it easy to line up with the top and bottom of a 4.25" x 5.5" card. I love anything that makes my stamping cleaner and more precise! I have to say that I saved my personal favorite card from today for last. Even though this Ikat stamp set is fairly modern and bold, you can create soft looks as well. 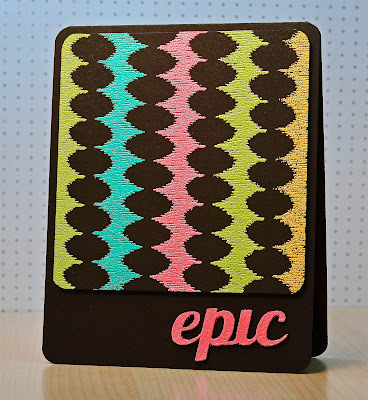 I stamped the Missoni styled strip on a diagonal onto Sea Glass Card Stock and heat embossed it with white embossing powder (yes my heat gun got a workout this release!). I stamped the For You sentiment (from a set to be introduced later this week) directly onto the card base using navy ink. I tied the matching Sea Glass Grosgrain ribbon bow at an angle (with some tape to help it stay in place) to finish off the card. This was one of those cards that took no time to make - bonus!! In honor of our Release Week, we will be giving away a $25 gift certificate to our store. Hi everyone! I hope that you are having a great week so far. 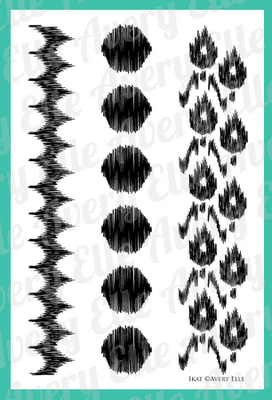 I thought that I would show you a little sneak peek of our four stamp sets that will be released this month. 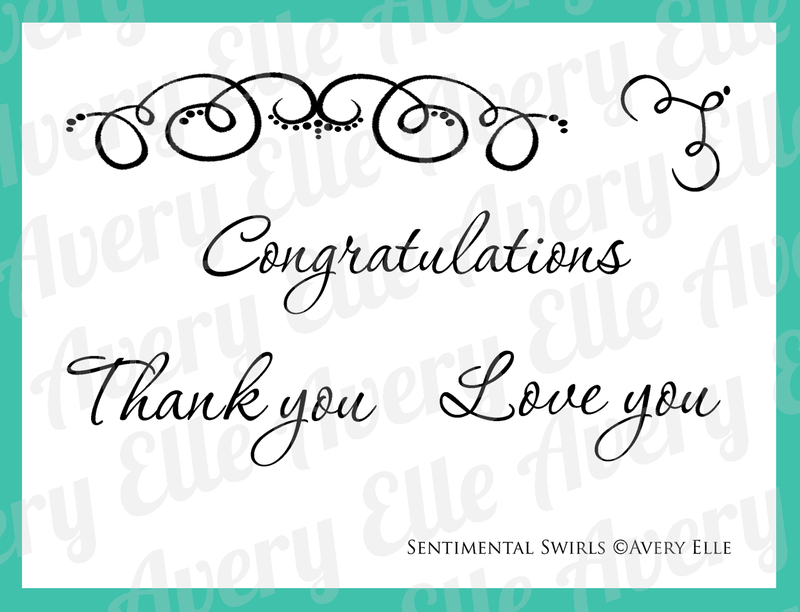 The sets, along with 4 new card stock and ribbon colors, will be available for purchase in our store, www.averyelle.com, on August 14th. Be sure to check back this Friday, August 10th, when we will be featuring one of our new stamp sets and some fun projects by the design team and me. We will also be holding a fun giveaway that you won't want to miss! Thanks for stopping by to take a peek! See you Friday! Check out this card that Chrissy posted on flickr. Don't you love how she combined our Bright Days and Framed Fonts stamp sets? What a brilliant single layer card! In other news, we are currently preparing for our August release. We will be releasing 4 new stamp sets along with 4 new card stock and ribbon colors. We will be featuring one stamp set a day starting August 10th and the entire release will be available for purchase on August 14th in our store. You definitely won't want to miss it!